CRAZY DISCOUNT! Was: $149.95 Now: $69.95! *This offer is only valid when checkout is completed within the indicated promotion time. Enter postcode and suburb to recalculate. 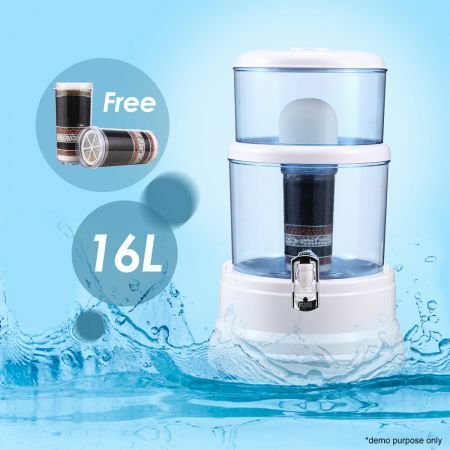 Water, water, everywhere…and every drop to drink with the 8 Stage 16L Water Filter. Forget about empty plastic bottles, forget about empty pockets & rid yourself the hassle of bottled water forever! This water filtration system is an easy way to enjoy mineral water in the convenience of your home or office. The built-in purifier lets you filter your own water without compromising your health or harming the environment. Affordable and convenient, the water filter is easy to install and a breeze to clean. It is as simple a tap water filter as you will find online. The 8 stage filtration system is specially designed to purify your drinking water to the optimum level. The 8 stages assure your water is free of organic contaminants, lead and all bacteria in addition to being softened & pH stabilised. No more germs, no more rust, no more bacteria, no more bad taste, just drinking water at its finest, and for a fraction of the cost of a bottled water addiction. Discover the benefits of convenient, clean water all of the time. Get this home water filter now and start turning your tap water into pure water. There will never be a reason to go thirsty! A Convenient & Comfortable Way to Drink Mineral Water At Home. 40.5cm x 33.5cm x 33.5 cm approx. Only for customers who bought and received the product. Fast delivery. Water bottle came with 2 extra filters Thanks. Crazysales accepts a range of payment options including PayPal,BPAY, Visa, Mastercard. Rest assured as all payments are processed using the latest SSL encryption technology! All items are sent via Australia Post or another courier. Once items are sent, delivery times may vary according to Australia Post or courier's delivery schedule. Most items are dispatched within 24 hours of payment clearance (BPAY may take longer). Transit insurance is used to cover all products. This product comes with a 1 Year Manufacturer's Warranty, please click here for details. For warranty and returns assistance please contact us. Statutory conditions and warranties also apply. Thank you for viewing this product. To purchase this product, click "Add to Cart". Save Money on Your Orders, Combine Shipping! Why not grab more than one item and save on shipping? To take advantage, just add two or more products to your shopping cart. (Products eligible for combined shipping are marked as Combine Shipping & Save). After you have finished shopping, proceed to checkout to see how much you have saved on shipping. Simply finalise payment on your order! Remember, there are greater savings to be had by purchasing multiple eligible products! If your order also contains items that are not eligible for Combined Shipping, you will be charged normal shipping rates on those items. If any discount offer on shipping fees are used on eligible items such as a coupon discount code, the item in question will not be eligible for any further shipping discounts. Actual savings will vary depending on the weight of the item and it's category. Why am I unable to receive any discounts when purchasing two or more products that are eligible for combined shipping? a) Due to minimum charges set by courier companies, there may be no additional shipping discount for individual items weighing less than 0.5kg. b) Items shipped via DHL / UPS or regular mail can only be combined with multiple of the exact same product to receive a combined shipping discount. Send This Deal To A Friend! Please fill out the information below and you will be notified as soon as the item below becomes available. So, you've found a deal to show your friend! Please fill out the information below and we'll send your friend a link to this item along with a message from you. Pay for your purchase over 4 equal installments, due every two weeks^ . 100% interest-free. No extras. No catches*. 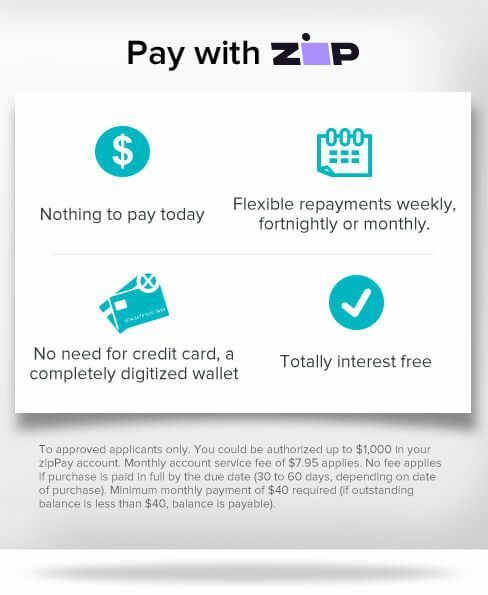 * If you fail to have sufficient funds available for Afterpay to automatically deduct payment on due instalment dates you will be charged a late fee of $10 and if the instalment payments remains overdue one week late, an additional $7 will be charged.